I have been having so much fun!! I have been creating yo-yo's with some Kaffe Fassett fabric. I have been using this new tool from Clover and wow does it make it easier to do than the older methods. You can find the tool here or at your local quilt/craft shop. I used the XL yo-yo maker and the large yo-yo maker. They have other sizes available too. 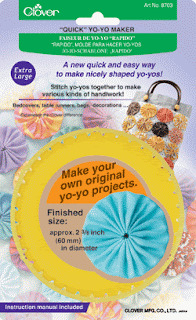 This is what the Yo-yo's look like, I love them sooooo cool and easy! I also bought the floral yo-yo maker, but have not tried it yet. I have to use up all my squares of Kaffe fabric first. Then I also wanted to try my hand at making a couple of pincushions. They are okay, not what I had envisioned. But I do like them. Now I am going to get caught up on reading all of you blogs! !